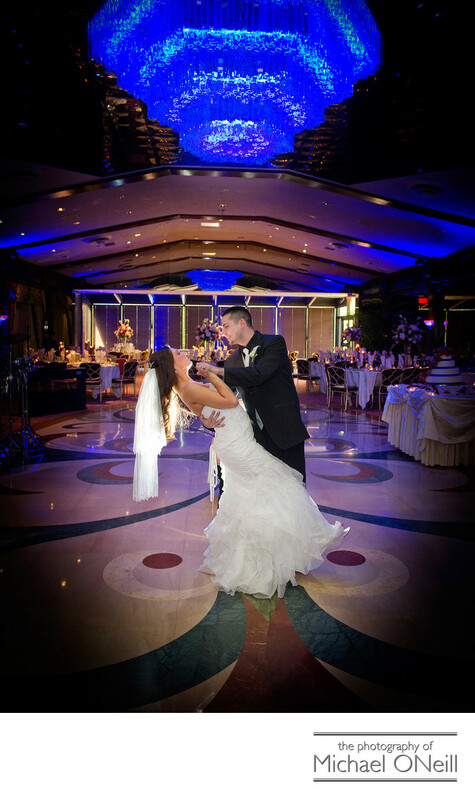 The Crest Hollow Country Club in Woodbury, New York is one of Nassau County’s greatest wedding reception venues. From the minute you arrive at this establishment you know it is going to be something special. Beautiful fountains greet you at the valet entrance then you step inside to one of the largest, most finely appointed lobbies you’ve ever seen. Outdoor cocktail hours and wedding ceremonies are held in different locations around the huge swimming pool or in any one of the many private gardens. The ballrooms are beautiful as evidenced by the picture you see here. This photograph was taken just before the bride and groom’s guests were invited into the ballroom. I love taking a picture like this so that the couple has a permanent memory of what their ballroom looked like before their guests were seated. You will spend a lot of effort, time and money decorating your reception venue, picking out the perfect floral centerpieces, linens, menus, favors, etc. Having a picture such as this one will enable you to recall the results of all your hard work and planning.